Heat Grill. Place chicken cubes on bamboo skewers and place in a shallow pan. Pour Garlic Rosemary Citrus Sauce over the chicken and let marinate until grill reaches medium heat. Grill skewers 8-10 minutes on each side, turning frequently so as not to burn. Add zucchini to the wild rice in the first half of the cooking process. This will soften up the zucchini. Soak golden raisins in apple juice to plump. When the rice is fully cooked, remove from heat and add the drained raisins, cherry tomatoes and toasted almonds. 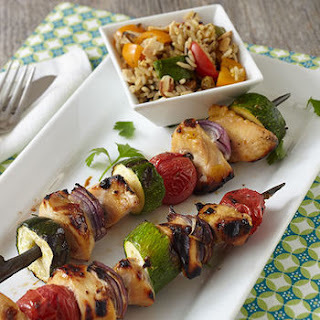 Serve the grilled chicken skewers over the wild rice. 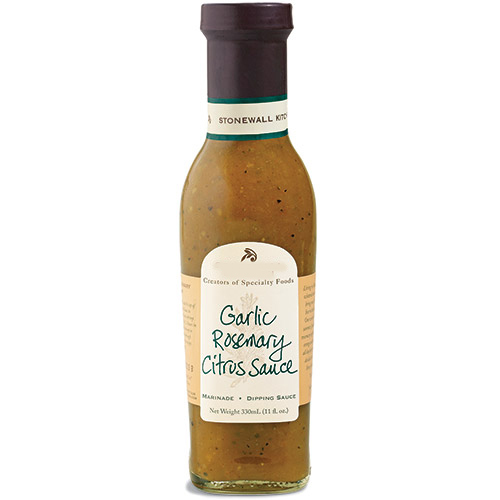 This versatile and vibrant Garlic Rosemary Citrus Sauce is sure to become a staple in your pantry. Perfect as a marinade, glaze or dipping sauce. The robust flavors of garlic and rosemary will add an enticing accent to chicken, rice or vegetable salads.